Tougher than 99% of solvers? I think not. A friend on Facebook sent me this link to a quiz that claims being able to solve the following brain puzzles puts your IQ in the Top 1%. The Top 1% of what, I have no idea. But I digress. I can’t resist a brain teaser, especially one with such a lofty premise, so I clicked the link and accepted the challenge. And I feel confident saying that, except for one question, I firmly believe every PuzzleNationer in the audience could conquer these “brain puzzles” effortlessly. To be fair, I have good reason to feel confident going into this challenge, because the example was the parking lot puzzle we featured on the Blog years ago. And thus, I clicked and ventured forth into the realm of supposed geniuses. The first question asked that we count the number of Fs in a sentence, counting on the tendency of people to miss Fs in small words like “of.” No problem here. The third was a brain teaser, one of those calendar-based ones like “If today is Thursday’s yesterday’s yesterday’s yesterday, how many days away is Friday?” No sweat. Then there were some optical illusions, visual manipulation, and spacial awareness puzzles, like what would such-and-such look like if this happened. That sort of thing. Easy-peasy. Then, as advertised, the parking lot puzzle showed up. The last one was the only real challenge. 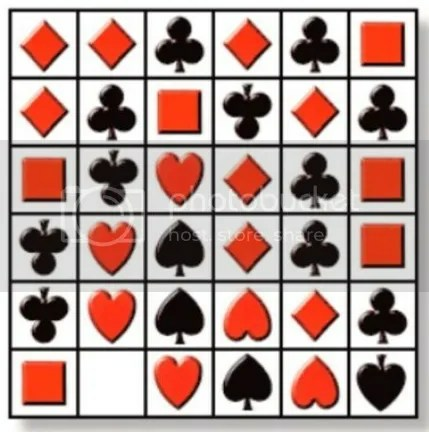 You were given a six-by-six grid full of symbols — black clubs and spades from playing cards, plus red hearts, diamonds, and squares, some upright, some upside-down — with one square empty. And you had to pick which symbol fit the empty space. Based on this assessment, your intelligence is extremely advanced. You are a genius with a near-perfect IQ. 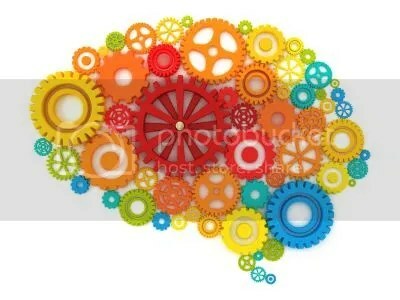 You have an incredible mastery of both analytical AND abstract thought processes. You are very number-orientated and have strong mathematical and logic skills. And on the other hand, you have a avid imagination and the keen ability to think outside of the box. Your core capacities include mental imagery, spatial reasoning, image manipulation, and strong artistic skills. 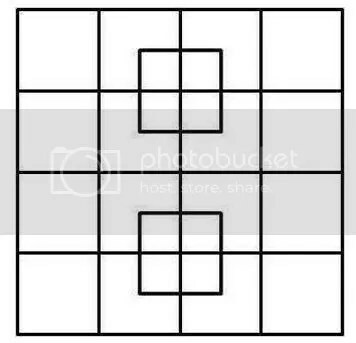 As evident by this test, you are excellent at solving puzzles. You will most likely succeed in technical, scientific, or mathematical fields. Now, I understand that most of these quizzes exist to make you feel smart and/or give you something positive to post on Facebook and share with friends and family. That being said, this is hardly a challenge that would exclude 99% of solvers. In fact, my fellow PuzzleNationers, considering some of the brain teasers we’ve tackled together, I think we’re all justified in posting that victory text on Facebook. I have no doubt that we’ve all earned it. This entry was posted in Games, PuzzleNation, Puzzles and tagged Brain teaser, facebook, games, Geeking Out, Pop culture, Puzzle to solve, PuzzleNation, Puzzlin' fool, Wordplay by gmdirect. Bookmark the permalink.